The Nirodha facilitators offer a possibility to discuss issues related to meditation or Dharma privately with a facilitator. These meetings are suitable for beginners as well as for more experienced practitioners. Do not hesitate to book a meeting, the question that you may have can be very simple, for example “How can I find time to meditate in the middle of a busy daily life?”. The meetings are offered on a donation basis (dana) and they are confidential. On Tuesdays the meetings are held at the Buddhist center Sampo, the address is Vetehisenkuja 3, 00530 Helsinki. On Wednesdays the meeting are held at Meditaatiokellari, Meritullinkatu 11B, Kruununhaka, Helsinki. On Thursdays the meetings are held at Hetkiä-space, Menninkäisentie 5C, 02110 Espoo. On Wednesdays the meetings are held at Dharma center Danakosha, the address is Museokatu 17 A, 00100 Helsinki. You can leave your donation for the facilitator in the dana box. Since there is no sound-proofed space at all of the meeting places, please wait for the start of you meeting outside the center. The facilitator will open the door for you at the beginning of your appointment. If there are available appointment times for other weekdays, the location will be agreed upon together with the facilitator. 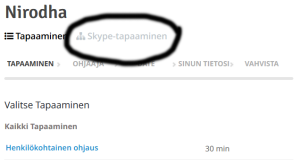 There may also be some Skype meetings available, if so, you will find them marked as Skype-tapaaminen (Skype meeting) on the booking calendar (as illustrated in the picture). If you have to cancel your appointments, please do it as early as possible to avoid missed appointments. When you go to the booking calendar you can see the names of the facilitators and their available appointments. The booking system is unfortunately in Finnish, but here is a step-by-step guide on how to book an appointment. We warmly welcome you to the meetings!